We used to have a leisurely start on a Saturday morning, but that went out of the window when the boys arrived. If you’ve been up since it was still dark, it feels like half the day is over by mid-morning. The answer? A nice early activity. We used to go to early morning toddler football – but didn’t want to be committed (i.e. paid up) weeks in advance. So, drop in sessions are the way to go for us now at the weekend. 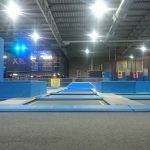 Which leads me to our latest discovery – toddler trampolining at Oxygen Freejumping! 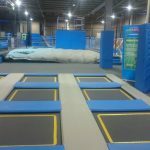 Oxygen Freejumping is an indoor trampoline park with a difference. 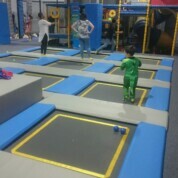 As well as the usual row of trampolines there are more than ten other areas to enjoy. You can jump onto a giant airbag or into a foam pit; play dodgeball, volleyball and basketball; try out your parkour skills; and more. 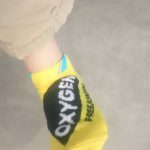 Oxygen runs special Little O sessions for Under 5s and an accompanying adult early on weekend mornings (9am, 10am) and twice a day during the week (10am and 1pm, timetables may vary). At those times your toddler can bounce around for an hour without being crushed by bigger children – although we can’t vouch for other over-enthusiastic parents… When we visited there was a special PJ Masks-themed week – G had a whale of a time jumping around, getting dressed up as one of his PJ Mask heroes, and trying out some of their super skills. As an added bonus, Little O sessions cost £5 per person – a big discount off the normal freejumping price. We’d recommend booking in advance as the toddler sessions are popular. You also need to buy some special trampolining socks (which have rubber grippy bits) or bring your own pair. It’s a small extra cost, but buy them once and you can use them on future visits. Our verdict: Try out a Little O Session this weekend – both adults and children will be jumping for joy and it’s guaranteed to use up all that lovely toddler energy! Oxygen Freejumping has 9 parks across the UK. We visited and reviewed the Croydon branch – details of other branches and timetables may vary so it’s worth checking before you set off. We visited independently, and did not receive any free tickets or inducements in relation to this review.